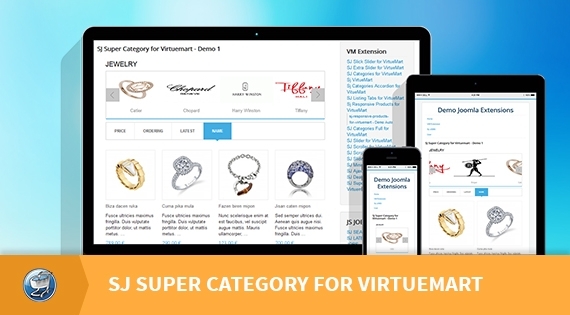 SJ Super Category for VirtueMart is now available for VirtueMart users. The module is used to show any category with subcategories and product list. The module is well structured with a slider for subcategories and product tabs by name, price, latest... Besides, the module supports lots of beautiful effects for both product and subcategories that you can attractively present your products to your visitors. In addition, with modern layout SJ Super Category for VirtueMart can be placed on any highlight position to emphasize your content. The user friendly back-end interface allows you totally control any item's parameters. And there are many more other awesome features that you can explore through the Demo.